Madness spreads across the globe! The tides of madness rise across the world. Poets and artists are driven mad by the light of the moon, and a mysterious play spreads insanity to its audiences. The Unspeakable One is stirring, and his cursed city tears through the dimensional walls. Lost Carcosa has come to Earth! 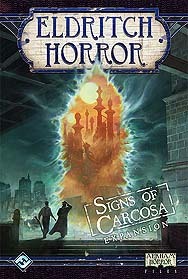 This expansion features Hastur, a dreadful new Ancient One. It also includes a wealth of new encounters, Mythos cards, and Prelude cards. Four more investigators join the game, along with Artefacts, Spells, and Unique Assets to aid them in their struggle. Eldritch Horror required to play.